Today, Lexcelera’s advance in machine translation engines extends to the newest game-changing technology: Neural Machine Translation, or NMT. This approach to automatically translating human language, based on artificial intelligence, is generating the highest quality automatic translations. Yet this technology is so new that only a handful of companies in the world today are capable of training their own NMT engines internally. Lexcelera is one of those rare companies. Lexcelera’s NMT expertise has grown from over a decade of experience building high performance machine translation (MT) engines for global customers. Behind Lexcelera’s pioneering technology is the simple power of humans who customize the engines to deliver the right terminology for each customer, language and domain, and who post-edit the output where fully human quality is needed. This guarantees objectivity when selecting the best engine for each use case. Lexcelera customizes individual MT engines for your company and your domain. Lexcelera hosts the engines and manages the entire process. When highest quality is needed, Lexcelera has one of the largest pools of trained post-editors. Benefit: Profit from the advantages of MT – optimized costs and speeds from fast to instantaneous – without having to divert internal resources to managing the machine translation process. The machine translation server and all associated repositories are set up on the customers’ premises but managed by Lexcelera. 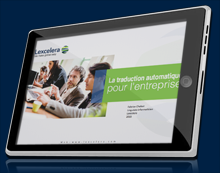 Lexcelera personnel remotely manage translation models and updates and maintenance. Benefit: Data security with the MT server located behind the corporate firewall. Up to tens of thousands of internal users can securely translate company documents without exposing their data to an online engine such as Google Translate. Lexcelera has the ability to embed its machine translation technology into websites, chat functions, online communities, help desk functions, forums, apps, and more. Benefit: Real-time translation capabilities fully embedded so the end users see their language fully integrated, not as an add-on. Brand integrity is protected by a 100% custom MT engine. Lexcelera’s consulting service can assist in creating a ROI model for MT and/or in setting up one or more MT pilots inside your company to determine the best technology and workflow for your needs. Benefit: A multi-engine test along with ROI modeling can help you avoid expensive mistakes. Lexcelera’s services may also be purchased on an à la carte basis or as packages. Want to learn more about MT?